Hi! I have never tried this before! I just downloaded Blogger for my phone, so bear with me. 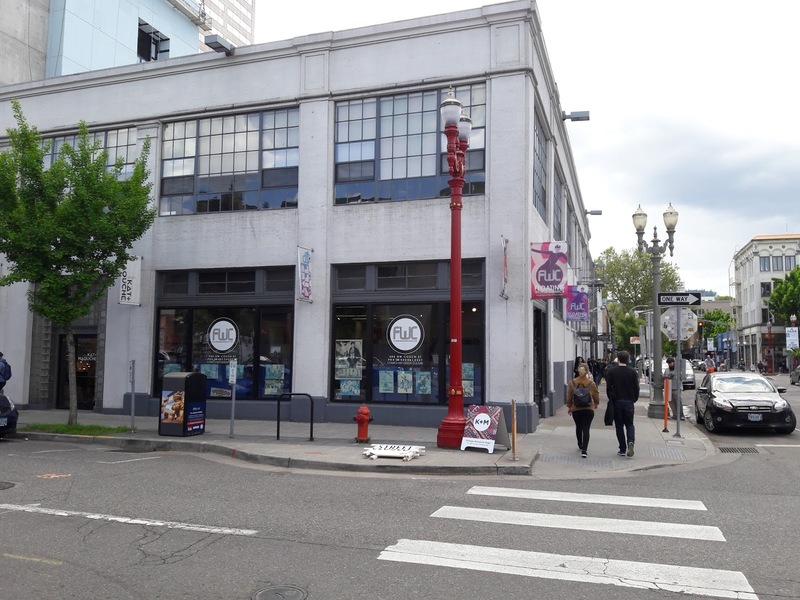 As many of you know, I live in Portland, Oregon, home of many comics creators, publishers, and comic shops. With today being Free Comic Book Day, I thought I would experiment by going to as many shops as I can, and writing about it as I do it. I will update this post as much ad I can figure out how. 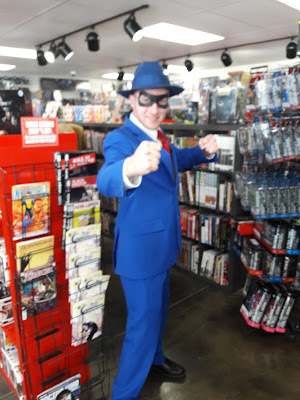 Enjoy your FCBD, be sure to buy something while you are there, and I hope this real time posting is fun for all of us! As it was last year, Excalibur is very crowded. They wind folks around their many back issues, with trades along wall. Only issue with this is it makes it nearly impossible to shop. You have to keep moving, and looking at or for a particular trade is difficult. Waiting in line at Excalibur. They were the only shop where I had a line. I was very happy to snag what I consider the essential books of FCBD: Simpsons, Spongebob, and The Tick. Those are always A+. I also got the other two main books I wanted, Fantagraphics (with a cover by Panel Pal Noah Van Sciver!! ), the IDW Trek book, and the Titan Dr. Who. Excalibur lets you get 8 books, then they also had a few extra freebees, including an Image Promo and A Wave Blue World. One of the latter's team was on hand and talked to me about a new online to print tie in to the FCBD comic. I will definitely check it out. My experience here is always that I wish I could browse more, as I mentioned above. However, the system works for them, and people who are into back issues had no trouble getting to those and purchasing them. Their staff is super-friendly, too, which is always a plus on a stressful day like this for many shops. This makes for a great first stop of the day, two years in a row. Purchases: Broken Frontier anthology, which I had wanted for some time. I stopped by on my way to another store to break up the commute. They are an awesome store if you are into Marvel and DC and collectibles. That isn't really my thing. All the specials were primed for that audience and I am so happy for them. But that isn't me. 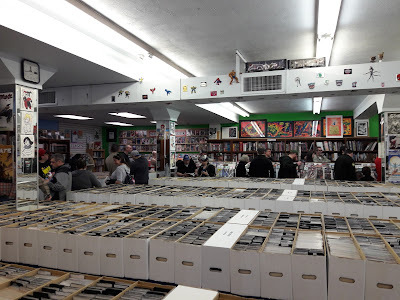 Their free comics were easy to find and the open floor space meant I could easily browse. Great set up.I grabbed a few more issues, including TMNT and the Betty Veronica one with an Adam Hughes cover (for kids?) and Humanoids offering. Things did a nice job of having a lot of interesting, well-priced items for their target audience. Their staff was also nice, but a little more hands-off than anywhere else I went. No hand-selling, for example, at least that I could see. However, they did have people dressed in costumes! Company Crossover. 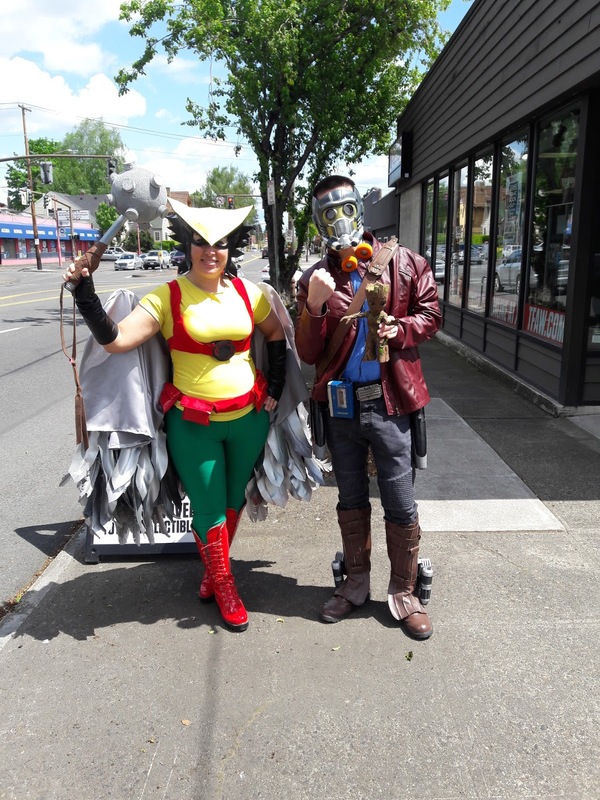 I love love love that Hawkgirl! I did not make a purchase here, sorry. Too hard to find your indie books among the Marvel DC stuff. On the other hand, 16 year old me (and my taste then) would have been in heaven, so if capes are your bag, this is your stop. Discovered this store is about 12 blocks from work now. That could be dangerous. Cosmic Monkey has some great art on their walls and I like their set up. They had old FCBD stuff outside and I picked up a few I didn't remember. They also had 50 cent boxes for old trades and I got some Steve Lafler (one signed! ), a few random anthologies (one containing my friend Morgan Pielli in it!) and some other things that were 50 cents so why the hell not? 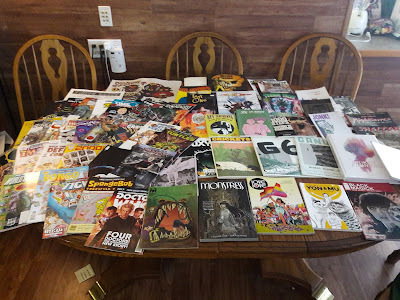 Inside, they had the free comics together, with a five comic limit. I only picked up three, all of them from smaller pubs I didn't recognize. By the time I'd arrived, their supply was starting to run a bit thin, but they had a ton of Secret Empire left. Huh. Can't imagine why. What I really liked was how Cosmic Monkey had your eye drawn to cheap volume one trades. I snagged Black Magick, because I wanted it in print (I had read in digital form.) Great marketing to new readers and easy way to highlight good books. Their staff was around, but not necessarily hand-selling items. On the other hand, with such great set-up of the floor space, that wasn't really necessary. People were buying. 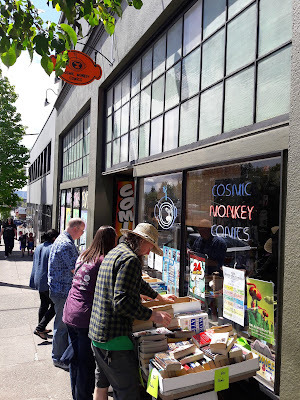 Cosmic Monkey really does a great job of using their space, and I always come away impressed. Now that I'm closer, I hope to visit more often. Purchases: Black Magick trade, and a bunch of 50 cent graphic novels. This is the shop I visit most often. 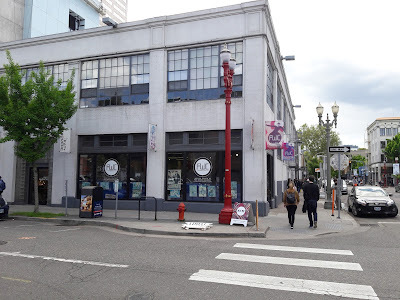 It caters most to my taste (small zines and micropress trades are featured as soon as you walk in the door) and it's also Downtown, so I find myself in its general vicinity a lot. All the other stores tend to take more of a conscious effort for me to get to them. As a result, it's where I keep my modest pull list. So while I was around, I grabbed my stash. 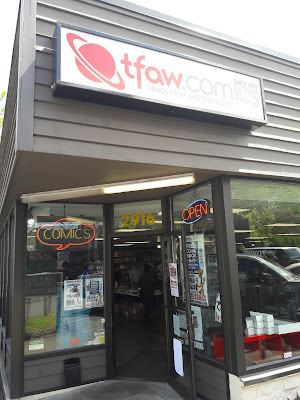 By the time I got there, most of their free comics were gone. No biggie to me. They did have a few I hadn't seen, so that was awesome. Picked up three. Did not appear to have a limit. The store was still very crowded by 3pm, and people were buying like mad. Naturally, I noticed that a lot of people, including the person in front of me, were buying lots of indie stuff. The woman at the counter was commenting all the way along, including on my own purchases, showing that they know their stock. I also got to see the framed art of Colleen Coover for Small Favors, which was neat. Her work is always incredible, whether it's adult or all ages! Floating World isn't a traditional comic store, and that's not a bad thing. 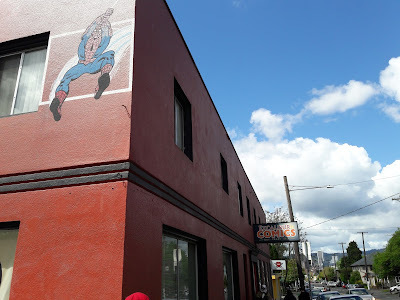 Its Free Comic Book Day isn't quite what you'd normally expect, so a traditionalist would probably not want to make it their only stop, but Portland Panel Patter readers definitely should make sure they hit it up. I'd like to go a bit earlier next year. Purchases: Lots of stuff. The Who and 2000AD books, a JM Dematteis from Boom! that I'd missed, two new books from Kevin Huizenga, and some other small zine-style comics that caught my eye for about 5 buck each. By the time I got to Books with Pictures, I was really, really tired. My backpack weighed a ton, and I couldn't close the straps properly. (Next year: Bring an extra bag, Rob! *) However, I was immediately greeting with friendly faces who had been working way harder than me. One of my friends, Kel McDonald was there to sign things, and she'd run out of her FCBD Buffy! So happy for her! I also got to see another friend, Virginia (creator of The Whys among other projects), who had agreed to help out. Books with Pictures has the best FCBD set-up I've ever seen. 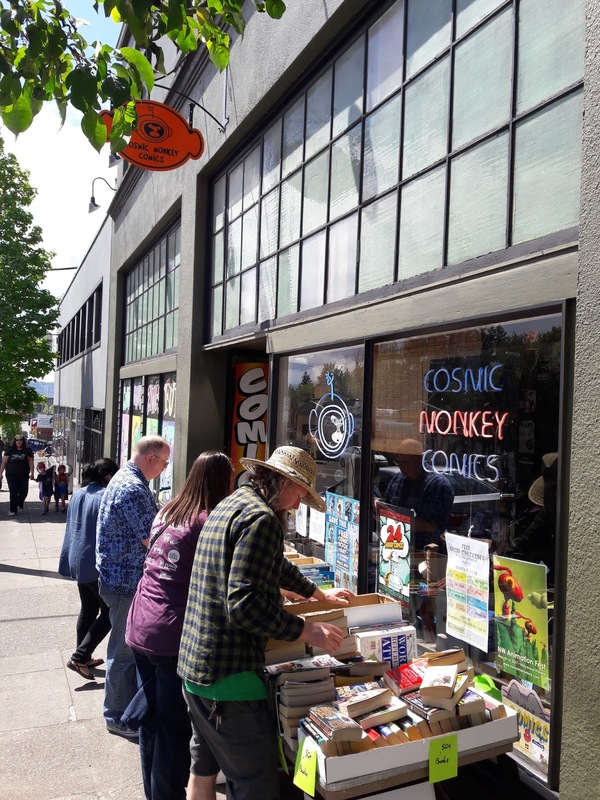 You're handed a special FCBD paper bag, which you can bring back on a subsequent visit in May for $2 off a purchase. Great way to convince folks to come back! You then walk along the offerings, picking up to 5. At the end, they seal up your bag and encourage you to keep shopping. No way to mix up the pay comics with the free ones, no way to take more than five comics, and you have people ready and waiting to help you at the front and end of the line. This is such a great way to work things. I did pick up my full five this time, as it was the last stop and they had a few I was interested in but hadn't grabbed yet. Then I spent some time looking around, as everything was 20 percent off. Books with Pictures is a great one-stop shop, as they feature a lot of Marvel-DC-High Image books, but also have indie comics (in their own section, thank you! ), zines, and a very nice special section in the center of the store for kids. Also, everything was 20% off a nice touch in lieu of a clearance section. I was so tired by this point that I barely registered that I should have taken pictures to show all this great stuff until I was on the ride home. Oops. 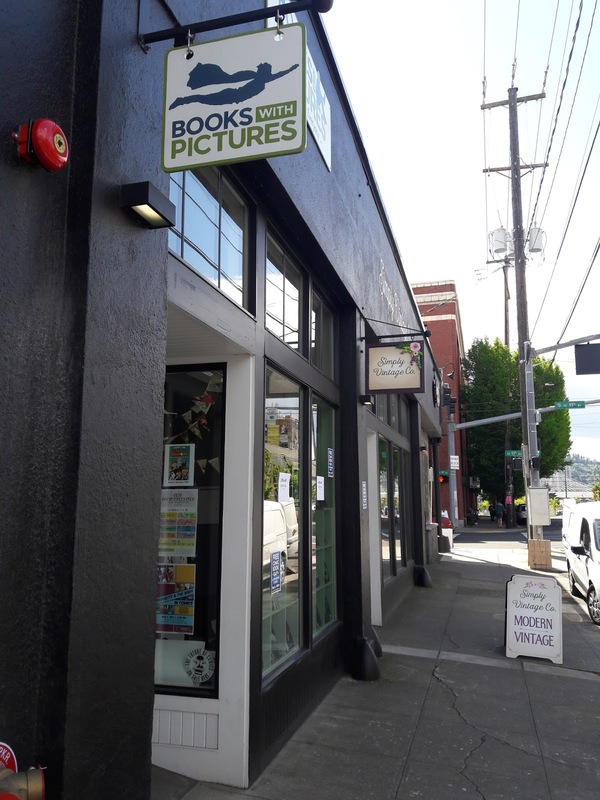 Suffice it to say that the people who work at Books with Pictures are extremely nice and I've had a great experience every time I stop by. Purchases: Monstress, Love is Love, and the Ito Cat horror book. That's a lot of comics. Doing Free Comic Book Day like this was a blast. It was kind of like going to a comic con, but instead of going to different creators, I went to different vendors. I hope to do this again next year. 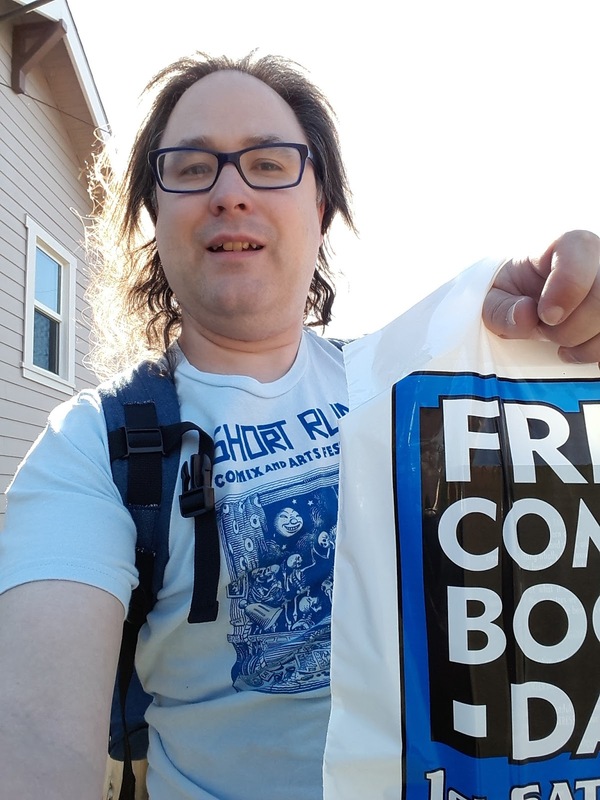 Thanks for reading my FCBD adventure! I hope your day was great, too! *I mean, I could just buy less books, but come on now!